Wood decks constructed of pressure-treated lumber should survive outdoors for at least 10 years with only basic maintenance. But homeowners willing to fully protect their deck from water and direct sunlight can extend its life to as much as 20 to 30 years. The best coatings system for waterproofing your deck consists of a semitransparent stain topped by a sealant -- applied on a regular, consistent schedule. When beads of water collect on your deck, that's one sign that your deck is protected from the elements. An oil-based semitransparent wood stain penetrates beneath the lumber's surface, hardening the outer layer of the wood. The stain's oil or alkyd _vehicle_ fills the wood's pores, blocking the absorption of water. The stain's pigment protects the _lignin_ -- which is the outer layer of your deck planks -- from ultraviolet rays. If the deck turns gray from UV exposure, the damaged lignin layer absorbs water and can eventually lead to rot. A wood stain is not a complete waterproofer, but it does help prevent water from infiltrating lumber. Waterproofing sealants can block 100 percent of the rainfall from the coated areas of your wood deck. These barrier coats form a thin, protective film over each decking plank. Some deck coatings -- described as water sealers -- contain high levels of paraffin and cause water to bead up on the surface. Polyurethane-based deck sealants, available in either oil- and water-based formulas, are comparably effective without the beading effect. 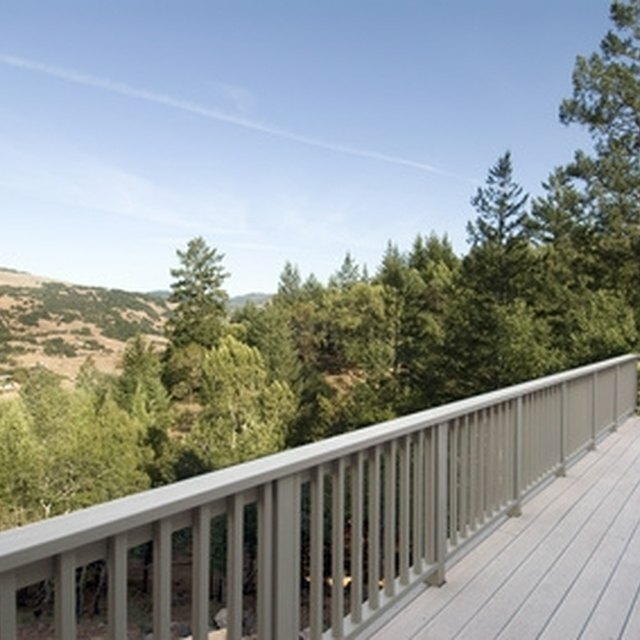 Many deck sealants are supplied as a clear finish, while others are tinted with a transparent wood tone. When you've invested serious money into a genuine wood deck rather than a composite, you'll want to see and feel the actual wood. A semitransparent stain reveals the natural grain pattern of wood throughout its expected lifetime, which is typically rated at two to three years. Paraffin-based wood sealers last three to six months, and water- or oil-based clear sealants usually perform their best for one to two years. The actual lifetime of each coating depends upon the type of wood, the degree of sun exposure, the amount of rain and snowfall, and the level of foot traffic. Apply the semitransparent oil stain within one or two months of building a new pressure-treated wood deck. The stain will supplement the lumber's built-in water-repellant treatment for its first season outdoors but allow any excess moisture to escape into the atmosphere. After six months to a year, apply a clear waterproofing sealant. When the sealant breaks down from UV exposure and foot traffic, the stain will continue protecting the wood until it's time to apply another coat of sealant. Some high-performance deck stains and sealants promise to last as long as 10 years, provided the homeowner performs an annual maintenance touch-up. If you decide to apply an extended-life sealant, be sure that the underlying stain can last at least as long as the waterproof finish. If you choose an extended-life sealant formulated with a built-in wood stain, the pigment may fade and stop performing before the sealant itself. Both stains and sealants are easy to apply. The simplest applicator is a medium nap roller attached to an extension pole, which allows you to roll the finish into place from an upright posture. Most deck coatings can also be applied by brush or with a garden pump sprayer. PaintPRO: Which Wood Care Product For Your Wood Deck Project? Should a Clear Coat Be Put on Top of Deck Stain?